Janhvi Kapoor and Ishaan Khatter are tirelessly promoting their upcoming flick Dhadak. After launching the cover of a magazine, the on-screen couple were snapped at the Mumbai airport on July 12, 2018. Janhvi and Ishaan headed to Kolkata for the next promotional leg. The actors are busy visiting various cities to promote the Shashank Khaitan helmed flick. 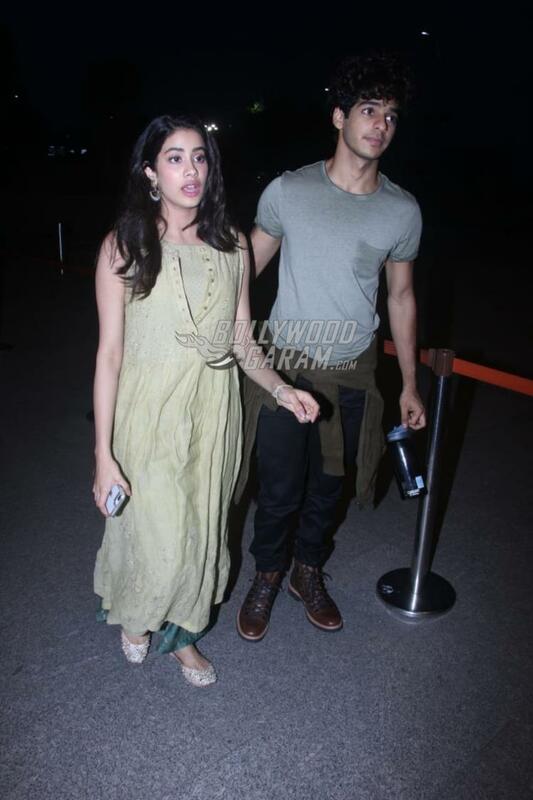 Janhvi for her travel schedule was seen in a casual golden kurta and green palazzos while Ishaan was seen in a grey t-shirt, black pants and an olive green color jacket. Upcoming film Dhadak is the adaptation of the Marathi flick Sairat and the Hindi version is set at the back drop of Rajasthan. A major sequence of the flick has been shot at Kolkata. Sairat’s music directors Ajay-Atul have also composed music for Dhadak. The songs of the film have already become popular. The film will mark the Bollywood debut of Boney Kapoor and late actress Sridevi’s daughter Janhvi Kapoor. Dhadak is ready to be released in theatres on July 20, 2018.